Woke up to the NOAA radio this morning. Severe T-Storm pass by the house. Only 1/4" in the bucket though. 5 miles down the road, East, different story, wind and hail! MORNING AS A WEAK COLD FRONT MOVES SOUTHEAST THROUGH ACADIANA. AEX, IFR VIS PSBL AT LCH LATE TNITE AS LOW LEVEL MOISTURE REMAINS. TOWARDS FLOODING CONDITIONS ON AREA RIVERS. MAINTAIN THESE CONDITIONS THROUGH THE REST OF THE WEEK. LOUISIANA...NORTHWEST LOUISIANA...EAST TEXAS AND NORTHEAST TEXAS. PONDING ON AREA ROADWAYS...AND LOCALIZED FLASH FLOODING. MORNING HOURS OF WEDNESDAY...MAINLY FOR CENTRAL LOUISIANA. Quote: .AVIATION...WEAK QUASI STATIONARY FRONT JUST NORTH OF THE I-10 CORRIDOR. WITH SUFFICIENT MIXING TO PRECLUDE CIGS, VFR CONDITIONS TNITE. TEMPS ARE HOLDING IN THE MID 60S. 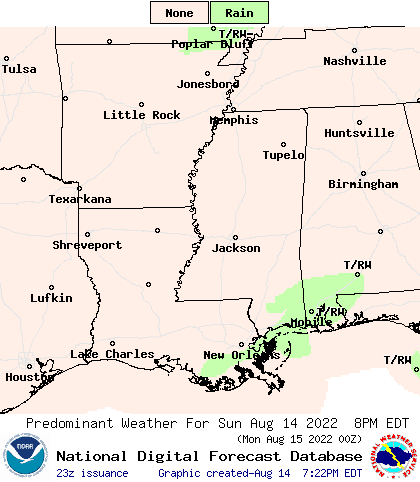 RAINFALL WILL BE POSSIBLE ACROSS CNTRL LOUISIANA. LAKES REGION. THEREFORE...A WARM SUMMER LIKE NIGHT WILL BE ON TAP. PATTERN IS EXPECTED TO HOLD INTO THE WEEKEND. EVENING...ESPECIALLY NORTH OF A LEESVILLE TO MARKSVILLE LINE. LATE THIS AFTERNOON EXCEPT EARLY EVENING FOR ACADIANA AIRPORTS. CALL WITH A WEAKER CAP. ACTION IS LOCATED NORTH OF THE RED RIVER WITH A COUPLE OF MCS`S. AREA...BUT HAS BEEN HAVING A DIFFICULT TIME PROGRESSING EAST. THIS ACTIVITY SHOULD CONTINUE TO WEAKEN AS IT MOVES TO THE EAST. HEAT INDEX VALUES COMING INTO PLAY OVER THE NEXT TWO DAYS. THUNDERSTORM ACTIVITY FOR THE REMAINDER OF THE WEEK AFTER TODAY. NEXT WEEK AND THUS JUSTIFIES A LOW END POP. NORTH OF I10 AS MODELS SFC BASED CAPES PROGGED NEAR 2500 J/KG. NEXT WEEK...OTHERWISE WEAK SOUTH TO SOUTHEAST FLOW WILL PREVAIL. CONDITIONS WILL BE POSSIBLE ON SATURDAY. WARM, HUMID and CAP in effect = SUMMER LIKE PATTERN ALREADY!!! THE FORECAST AREA. OTHERWISE WARM AND HUMID CONDITIONS WILL CONTINUE. TIGHTER TODAY SO WILL HAVE SCEC FROM HIGH ISLAND TO CAMERON. Quote: THIS HAZARDOUS WEATHER OUTLOOK IS FOR PORTIONS OF SOUTHEAST TEXAS. AFTERNOON AND EARLY EVENING AS THEY DISSIPATE. HAZARDOUS WEATHER IS EXPECTED AT THIS TIME. WITH JUST SOME HIGH LEVEL CLOUDINESS MOVING IN FM THE WEST. MID TO UPPER 80S AND LOWS IN THE UPPER 60S TO LOWER 70S. DAYS WITH SEAS RUNNING BETWEEN ONE AND FOUR FEET. SOUTHWEST LOUISIANA...WEST CENTRAL LOUISIANA AND SOUTHEAST TEXAS. 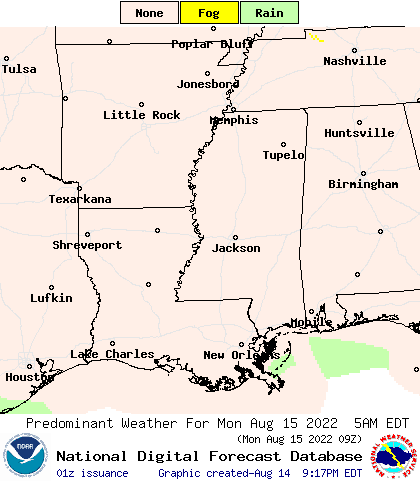 AREA OF EAST TEXAS TOWARD CENTRAL AND SOUTH CENTRAL LOUISIANA. LIGHTNING. STORMS SHOULD DIMINISH DURING THE EVENING. SPOTTER ACTIVATION IS NOT EXPECTED TODAY OR TONIGHT. NORTH OF THE FRONT WITH WIDESPREAD IFR CONDITIONS IN THE AEX AREA. INDICATING WEAK RIDGING OVER WRN TX AND A TROUGH OVER THE ERN US. RUNNING ABOUT 5 TO 8 DEGREES COOLER THAN AT THIS TIME LAST NIGHT. EVENING WITH THE LOSS OF DAYTIME HEATING. AND SLIGHTLY COOLER WEATHER FOR THE EARLY PART OF NEXT WEEK. FLAGS ARE ANTICIPATED AT THIS TIME. CLOUDS AND SOUTHERLY WINDS AROUND 10-15 KNOTS. HIGH PRESSURE OVER THE SERN STATES RIDGING ALONG THE GULF COAST. LOW CLOUDS DEVELOPING ACRS THE LOWER MS VALLEY. BRING DRIER CONDITIONS BY MONDAY AFTERNOON INTO TUESDAY. MOVE INTO THE AREA...WITH LOW TEMPS NEARER TO SEASONAL NORMS. WEAKENING AS IT PROGRESSES SOUTHEASTWARD TOWARDS THE NORTHERN CWA. CONDITIONS EXPECTED REST OF TODAY. ARE FORECASTED TO DIMINISH ON MONDAY.